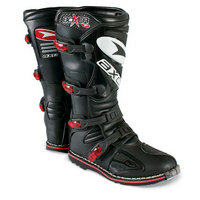 These AXO Boxer Motocross boots have all the style and functionality that you've come to expect from AXO. The outside is constructed out of a flexible leather to enhance both the style and the comfort. They are accented by four floating buckle bases which allow maximum control over fit and ensure that they maintain stable and secure alignment. Two nylon side struts increase lateral stability and support, and the boots feature AXO exclusive MX style soles. The top of each boot is sealed by synthetic gator material. A steel shank and steel toe cap round out the AXO Boxer boots creating the sturdy protection that you need. These boots would fit in any rider's gear collection.